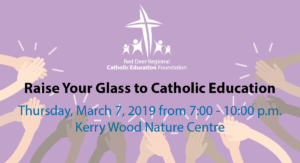 Established in 2009, the Red Deer Regional Catholic Education Foundation puts on an annual fundraising event to help fund faith-based initiatives that are not provided by Alberta Education. These fundraisers rely on sponsors to raise funds that are directed to students through various projects and scholarships, initiatives at Red Deer Catholic Regional Schools. Without the support of our sponsors, these projects and initiatives would not be possible. Special thanks to our sponsors for making the Raise our Glass to Catholic Education event possible. Their help and generosity are greatly appreciated! In June 2018, the Red Deer Regional Catholic Education Foundation announced funding for 18 school based projects ($39,000) and four Division projects ($11,000) for a total of $50,000. In addition to funding these projects, the Foundation will award $2,500 in scholarships to five students during the fall of 2018. Interested in funding some of our projects?